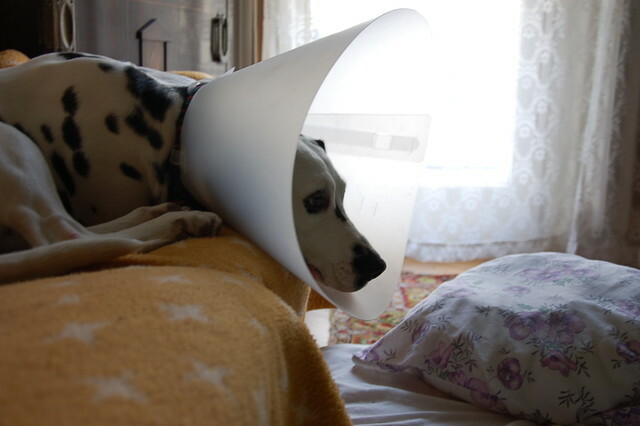 This is Lucky in a huge cone after neutering. It’s been two days since he got through the surgery and he’s doing pretty good. 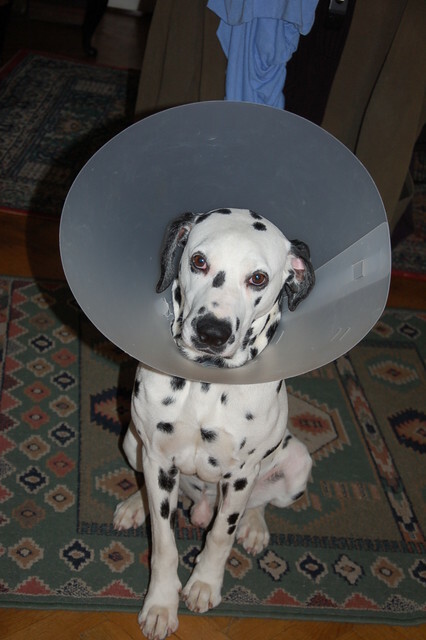 Fosterdad provides him a comfortable environment and tries his best to cheer up the long days of recovery. 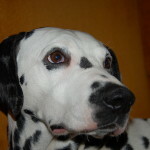 He serves Lucky delicious treats: grilled chicken, bolied rice and slices of ham topped with a little sour cream… as Prince Lucky refuses to eat dry food! 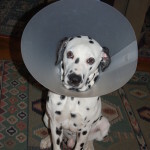 Well well, he’s a Dalmatian and he surely knows how to wind himself round people’s finger. 16.12.2013. – Lucky is here! 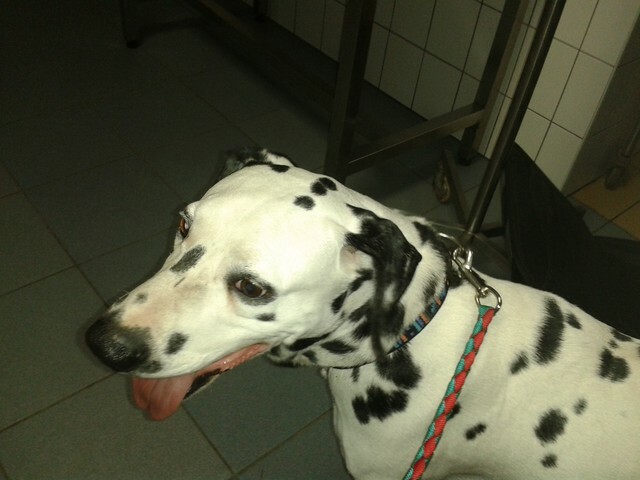 The Dalmatian male was wandering on the streets of Szeged near a 4-lane highway. He was seen there often in the past weeks. 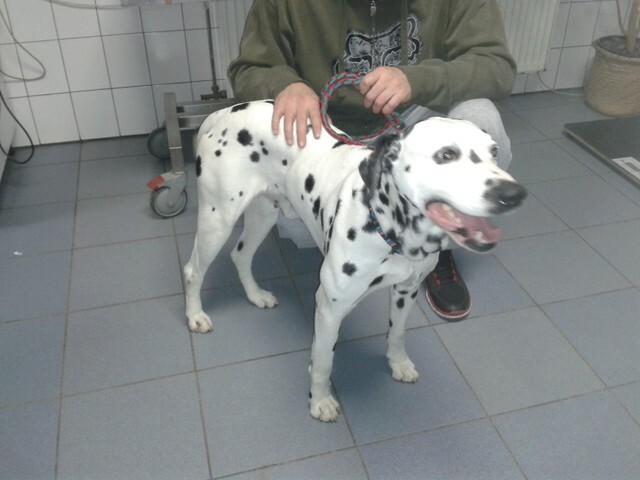 Animal rescuers managed to catch him this Wednesday and our local volunteer offered to foster him for a few days. She has seen him before, asked around and told us that the male had lived among pretty bad circumstances. 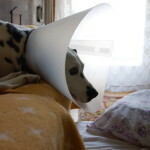 The wounds on his neck come from being put on a chain, when he was not away from home. We are thankful to the rescuers who caught the dog and took him to our volunteer. supposed that he has no vaccinations. Thank you, Mia for your help and for taking care of him until we found him a fosterhome. 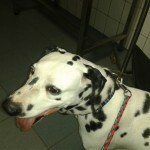 Friday evening we sent out a post to find a transport and two offers came in immediately. Saturday morning, Eszter’s car refused to start but fortunately the other applicant jumped to our call, when we told her that she is our only hope. 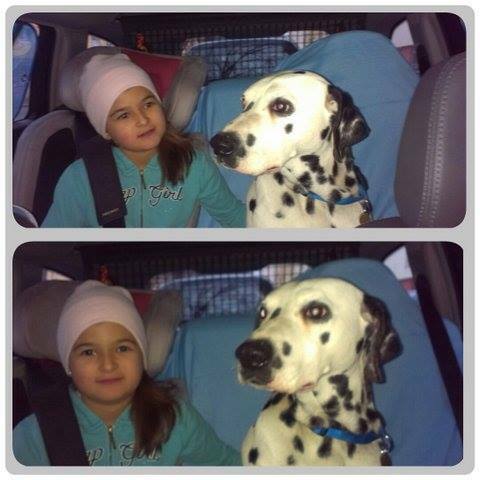 Her daughter accompanied her to Szeged to pick up Lucky. They praised him for his nice and calm behavior during the 2,5-hour ride. Thank you, dear Gizus for helping us out in such a hurry! Lucky was much awaited by his fosterdad. 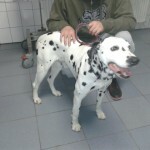 We visited the vet and the young Dalmatian male received a vaccinations and a microchip. We bought him antiworm pills and a spot-on, gave him a HDR name tag and he was ready to move to his fosterhome. 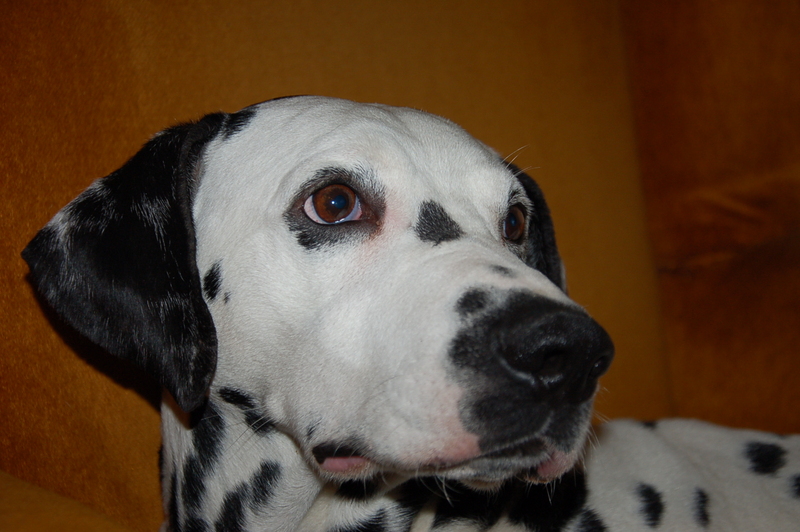 We just got the first news: he feels good in the flat and finds the bed and the armchairs pretty comfortable. He will need a few days to get used to this new situation and trust his caregiver but so far, he seems to enjoy his new life.